Ice Cream: Who Eats The Most Ice Cream in America? You are in Home > Blog > Food & Drinks > Who Eats The Most Ice Cream in America? Who Eats The Most Ice Cream in America? Ice cream...everyone loves it, right? Sure. But there are some parts of the country that are obsessed with this cool treat. So who eats the most ice cream in America? 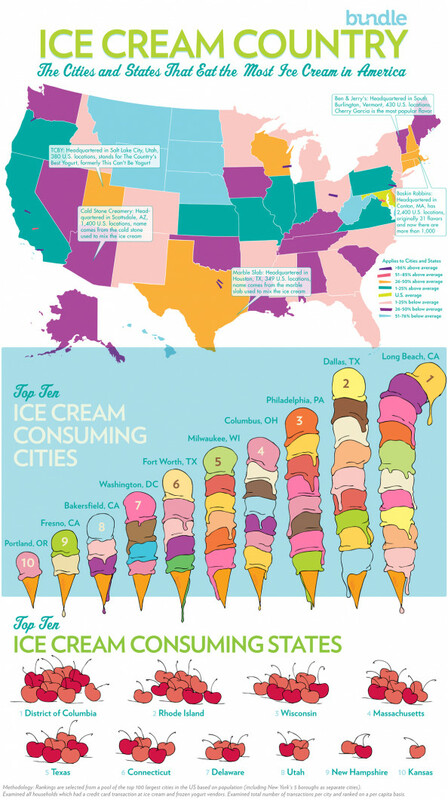 This infographic from Bundle pinpoints what cities and states consume the most ice cream and frozen yogurt per capita. It turns out the residents of Long Beach, California enjoy it the most. Dallas came in second while the Philadelphia ranked third. Researchers found that when it came to the highest consumers per state, the District of Columbia topped the list. Rhode Island and Wisconsin came in second and third, respectively. The infographic also has information on the top five ice cream chains in the country. Did you know the best selling flavor at Ben & Jerry's is Cherry Garcia? Or that Baskin Robbins has 2,400 ice cream chains across the United States? Check out other cool facts by reading below. If you feel inspired, you can try your hand at making homemade ice cream.